Emmy award-winning composer Thom Sharp was born in southeastern Ohio’s Appalachian foothills. After receiving a degree in music and teaching briefly in the public school system, he moved west to seek fame and fortune as a professional composer, arranger, and orchestrator. After landing in California, Thom wrote arrangements for The New Christy Minstrels, Joe Sample, Wilton Felder, Harry Connick Jr. and others. His television and film credits are extensive. He orchestrated music for the movies When Harry Met Sally, and City Slickers. He has written music for numerous animated television series, including Aladdin, Little Mermaid, Toonsylvania, Casper and the award-winning “New Adventures of Winnie the Pooh”. Thom scored the movie “Ping” staring Judge Reinhold, Clint Howard, and Shirley Jones. 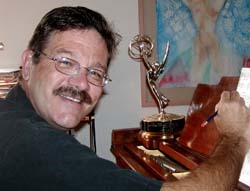 Thom co-wrote, arranged and produced Sue Robert's Parent Choice Awards-approved children's CD “Songs from the Circle”. And most recently produced the album "SunLight, SoulLight" which includes the artistry of some of Los Angeles’ finest musicians. Thom taught at the acclaimed Grove School of Music for several years and currently teaches Film Scoring in the entertainment studies department of UCLA extension. Thom owns Sharp Mountain Music, which specializes in music for string orchestra. Along with more traditional original works and beautiful arrangements of Brahms and Faure art songs, Sharp Mountain Music offers an extensive collection of alternative styles at every grade level.